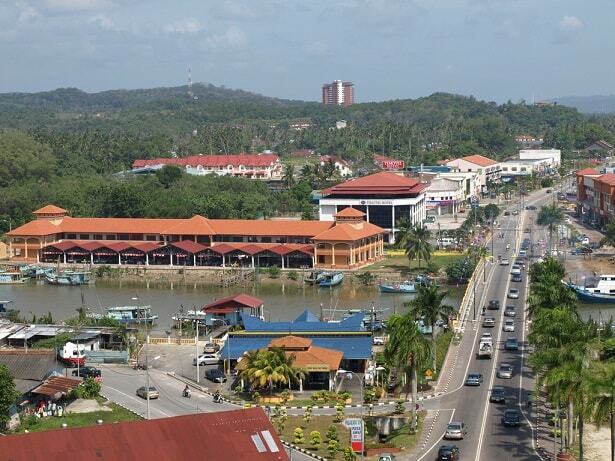 Mersing is 136 Kilometres north east of the state capital Johor Bahru. It's also the main port for ferries to Pulau Tioman and the more than 40 other islands in the Seribuat Archipelago. 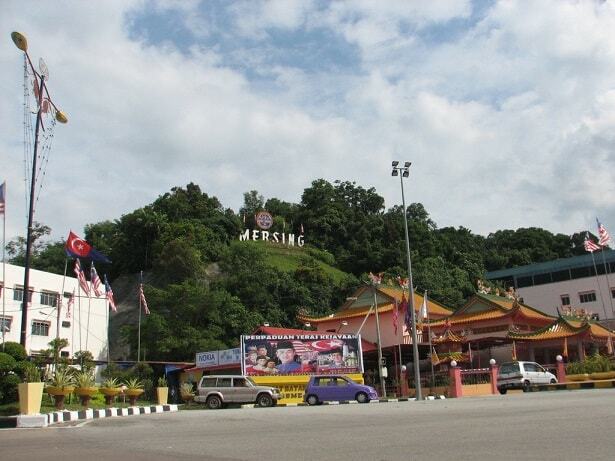 Mersing is the gateway to all those beautiful islands. It used to be a sleepy fishing village. There are still many fishing boats on the river, as well as a local wet market and fishing-related industries. It lies along the South China Sea at the mouth of the Mersing River. Its predominantly Malaysian residents live in coastal and riverside fishing villages. There are some local tin-mining settlements and rubber estates. An embarkation point for the islands in the Seribuat Archipelago and a regular port of call on the east coastal trade route, Mersing is linked by road inland to Batu Pahat and south to Johor Bahru and Singapore. Daily buses are arriving from Kuala Lumpur, Johor Bahru, Singapore, Kuantan with tourists. The bus station is at the shopping center "R&R Plaza". That's near the ferry terminal. They hop off the bus, buy their tickets and are leaving for the tropical islands in the South China Sea. Near the bus station are also a lot of taxi's they will bring you to Kuantan, Kuala Lumpur, Johor Bahru or to the nearest train station in Kluang. Mersing is a relatively small town with several streets and roundabouts linking the roads, one can just about walk around Mersing town in 1hour. You don't need a taxi for that. Local buses are going from another station. They will bring you, for example, to Tanjong Leman. 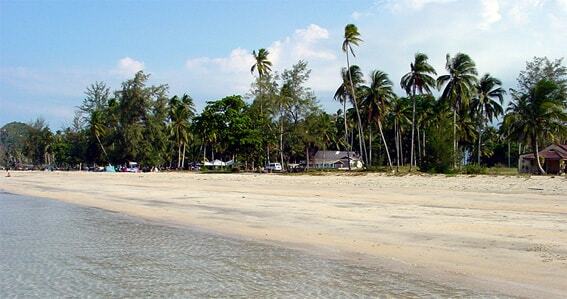 From Mersing, tourists can visit many nearby beaches. Beaches in the Mersing area rival beaches on the islands nearby. These are easily accessible from Mersing town. Other interesting places to visit near to Mersing town are Endau town, a major off-shore fishing port in Johor (about 33 km from Mersing town) and Penyabung, a very quiet fishing village located in a beautiful cove by the sea (about 20 km from Mersing town). Another attraction is the Endau Rompin National Park in the north. In the town you find travel agents, shops, restaurants (also a KFC). Mersing has a mix of the whole countries main dishes. Guest Houses, Hotels offer day-tours that include visit to rubber plantations, palm oil plantations, etc. Other popular one-day tour is to visit and snorkel around 4 or 5 of the offshore islands. In Mersing, there are some, but be alert...not the safest of areas actually in the city at night. In spite of what everyone is saying: Mersing has an airport. It's not so big. It's just an air strip. Mostly it's used for sky diving. No planes of Malaysia Airlines are landing there. Even not Berjaya Airlines. On the photo you can see the air strip very close to the sea. The length of the runway is only 1200 feet. 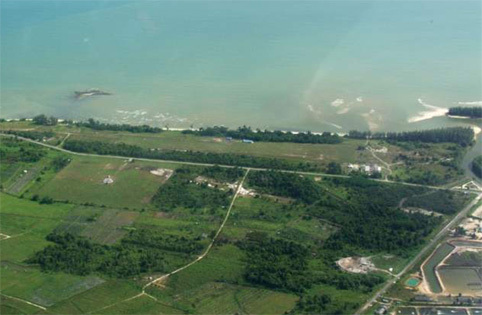 The name of the airport is: Mersing Airport. The beach in Mersing is not for swimming. It is dirty (plastic bottles, junk), shallow and muddy. The nearest beach for swim is 15km North in "Air Papan". This will cost you around RM15.- to get there. In Air Papan it's very relaxing and isolated. The beaches are incredibly beautiful here. 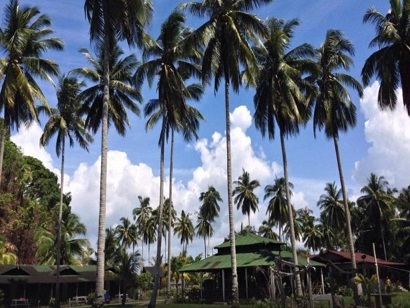 This village of Air Papan is flanked by hills and dotted with many species of trees and palms. The beach is a popular picnic area where the "Pesta Air Papan" (Air Papan Festival) is celebrated on the 1st of May each year. This event has always managed to draw such a huge crowd that the available chalets are almost unable to contain the demand! The festival is fun-filled with food and games! There are also cultural performances. Asides from the Pesta Air Papan, the beach is a popular spot, drawing lots of visitors to it every weekend and public holidays. Its clear blue waters is definitely a contributing factor to its popularity. When the weather is beautiful, you can even see the outline of other neighbouring islands. speedboat - 7:30, 13:00 duration 1.5hrs. To P.Tinggi & P. Sibu : ferry leaves from Tanjung Leman (see that site). In Mersing is a Seri Malaysia Hotel (best Hotel in town), Timotel and a Embassy Hotel. There are 3 backpacker style hostels, some rent-a-room style hotels (only 2 rooms in a family's house) and many Chinese style hotels. Kuala Lumpur - (access the PLUS Highway) Sg. Besi TOL - Exit Air Hitam - Kluang - Kahang - Nitar - Mersing. Estimed travel time 4-5 hours. Car Park services are available at both Tg. Gemuk and Mersing jetty. Parking charges are at around RM 7 Night inclusive of security. Changes to fares and time schedules are at the discretion of the bus/coach operators.